Altoghether there are 40 members (35 companies and 5 supporting members including 1 university, 1 chamber and 3 companies). Among the members there are 8 micro, 17 small, 7 medium size companies, 1 municipality-owned (100%) company, and 2 universities. 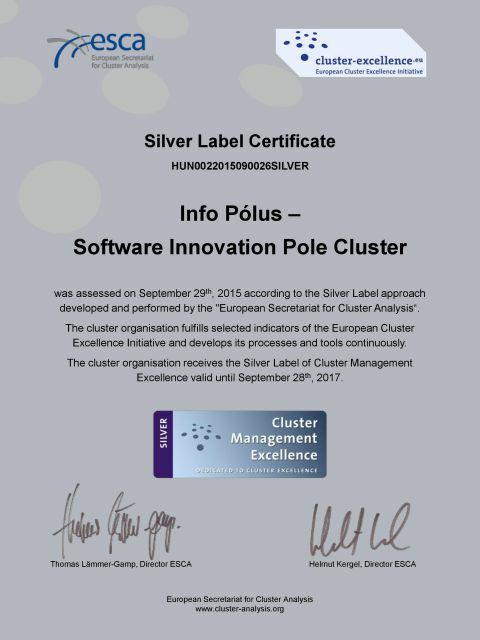 The Cluster successfully renewed its Accredited Innovation Cluster title for another 2 years in 2017. Activities of the Cluster primarily focus on business and administration (governmental) informatics and artificial intelligence solutions; software quality assurance; “SMART” informatics and Big Data applications; Application of mobile and embedded systems and Cloud computing. contributes to the establishment of knowledge-based, high value-added economy by software industry development especially in the South Great Plain Region and the area of Szeged City.